How Do Patients Feel About Telemedicine Services? Telemedicine, the remote delivery of medical treatment via technology, is becoming more and more prevalent in the health care industry. To learn more about what patients think of telemedicine services, Software Advice conducted a survey of about 400 medical consumers gauging interest in and impressions of video conferencing as a replacement for in-person doctor visits. Seventy-two percent of patients polled don’t know if their medical insurance covers telemedicine. The vast majority of patients—83 percent of those polled—have never used video consultation services. Patient interest in telemedicine services is high, with 77 percent saying they would be more likely to select medical providers that offer it over ones that do not. Of those patients who have used telemedicine conferencing, 51 percent appreciate the convenience and the comfort of consulting a professional from home. Telemedicine has come a long way since its early days of radio-based communication. Today, over 50 percent of U.S. hospitals offer telehealth options, and more and more health care providers are looking to incorporate telehealth into their available plans. Despite current uncertainty about the direction American health care is going, evidence supports the fact that legislators are interested in telemedicine. In March of this year, the Telehealth Innovation and Improvement Act of 2017 was introduced in the Senate. Just a few days later, Democrats and Republicans on the Senate Finance Committee put forth S.870: Creating High-Quality Results and Outcomes Necessary to Improve Chronic Care Act of 2017. Among other things, this bill would allocate more funds to Medicare to be spent on making more telehealth services available to patients at home. Even with this impressive reception within the government, medical technology vendors are still facing difficulties when it comes to implementing telemedicine. The most apparent challenge is the lack of patient knowledge regarding their telehealth options. Between 2015 and 2016, the number of major U.S. employers to offer health insurance coverage for telemedicine services increased from about 30 percent to about 60 percent. Currently, every U.S. state (with the exception of Rhode Island) offers some kind of coverage for telemedicine care, either through Medicaid or through requirements for private insurance providers. Despite this fact, a large number of patients are unaware of their medical options when it comes to telehealth. Only a combined total of 28 percent of patients polled were well-versed enough in their health insurance coverage to say whether or not telemedicine was included in their plans. This lack of awareness speaks volumes about the limited information being circulated by insurance providers and employers. It’s clear that software vendors who hope to increase telehealth adoption rates in the U.S. must start by working with providers to educate patients on their options. Of the medical consumers surveyed by Software Advice, only 17 percent had experience using telemedicine services. This statistic could correlate with the number of patients who don’t know if telemedicine is available to them; indicating that an increase in awareness will result in an increase in use. It might be tempting to draw a dismal conclusion from the number of patients who have not used telemedicine, patient’s interest tells another story. Patient interest in exploring video conferencing options is high, with 77 percent being more likely to choose a new doctor based on their telehealth options over doctors who do not offer them. The first step in implementing telemedicine on a broader scale is for it to become commonplace among physicians. Once that happens, providers can work together to teach patients about their options in order to encourage its use and make telemedicine services the new normal. The medical consumers we polled who have used telemedicine conferencing had a lot to say about the pros and cons of this service. When asked what benefits they enjoyed most, a combined 51 percent said that a major benefit is not having to leave their home. On the other end of that spectrum, patients were least satisfied with missing out on physical exams during video conferences. The lack of physical examinations came up more than once in this study. We asked our participants whether they would prefer to seek in-person care or a video conference with doctors when experiencing a set of symptoms. 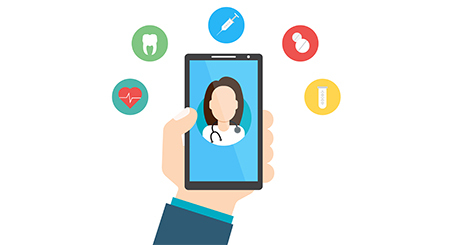 This suggests that, while patients are definitely open to exploring telemedicine services, many consider in-person exams to be more beneficial. Considering the level of discomfort any one of the above symptoms can cause, it shouldn’t be too hard to convince those afflicted to stay at home and get treatment, rather than go out in public where they might spread contagious illnesses. The biggest challenge facing telemedicine providers today is educating patients. People are interested in replacing in-person visits with video conferences—especially considering its convenience. But, the vast majority of respondents don’t know much about this service or their insurance options. Once this hurdle is overcome, though, physicians absolutely stand to benefit from making telemedicine available to their patients. And software vendors are facing the same opportunity by spreading the word about their systems. In other words, the future is bright for telehealth and those who offer it. The concept of telemedicine was designed to address the needs of rural patients who had limited access to medical care simply because they lived too far away. That continues to be the primary target, as demonstrated by the U.S. Department of Health and Human Services’ (HRSA) creation of the Office for the Advancement of Telehealth in order to better serve Americans living in rural areas. However, those living in urban or suburban locations are taking advantage of these options as well. While more information is needed to draw specific conclusions from this, one theory may be that suburban millennials are using telemedical services more and more. This generation is, after all, known for its embrace of technology-based services, and recent studies of the latest census data indicate a significant portion of this age group are making their way to the suburbs. Use of technology-based medical services is increasing, and that isn’t going to change. Video consultations and telehealth services will become more and more popular as younger generations enter the job market and make use of their own health insurance. However, that still leaves room for vendors and physicians to service rural patients, as it’s apparent there is a gap there. The data reported in this article was collected using an online survey of 11 questions. A total of 393 responses were used (326 of which had never used telemedical video conferencing and 67 of which had). Software Advice performed and funded this research independently. If you have any comments or would like to obtain access to any of the charts above, please contact lisa@softwareadvice.com.